Have you ever wondered how you should treat a wooden palette before painting with it? And what’s the best way to clean a wooden palette after you’re done painting? Keep reading, I’ll explain how to keep your hand held wooden painting palette in perfect condition for oil painting! When I first started painting in oil paints I was instructed to use a pad of disposable palette paper on which to mix my oil paints. I never really questioned this methodology and continued to use palette paper for nearly the next two decades. It seemed to be a convenient way to mix paint and something I just got used to. I always had a small table near my easel and mixed my paints on the table. With the proliferation of artists sharing their techniques on the internet and via various forms of video I noticed that most professional artists used a hand held wooden palette. You know, that old looking kind of painter’s palette that has almost become the cliché form of clip-art that means “art”. I thought that maybe giving one of these wooden painter’s palettes was worth a try. On my next trip to the art store while I was picking up some stretcher bars I ended up buying a wooden palette for around $8. It was an oval style palette measuring about 14 inches across the longest dimension. The wood felt mostly raw and if was prepared in anyway by the manufacturer it didn’t appear to be prepared in any durable way. I read up on some various ways to prepare a wooden palette for paint mixing and got to work. More about that in a moment. Besides being a wee bit wasteful, relying on disposable palette paper has some disadvantages especially when compared to a wooden palette. For starters you can’t comfortably hold a pad of palette paper. It has to lay flat on a table. This means you’ll constantly have to turn away from your painting to mix your colors and reload your paint brushes. That turning motion, although seems short in time, will consume massive amounts of time over the course of say one year. You lose hours of actual painting time having to turn and reach. A wooden painter’s palette brings all your paints right to your hands. It moves where you go! Once you get used to a wooden palette using palette paper gets really annoying. Having colors right near my brushes saves so much time and has become so much more comfortable! You can use a raw, untreated wooden palette for painting but you won’t like it very much. The oils from your oil paints will seep into the wood and dry your paints out. It will also be harder to scoop up the paint blobs with your palette knife. This would get better with time as the wood soaks up the linseed oil from your paints and builds up its own layer of a pseudo-varnish, patina-like sort of finish. I’ve tried preparing a wooden palette using both methods and although I think the linseed oil treatment is far superior I’ll cover both techniques. 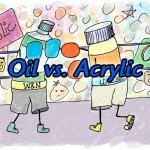 Any varnish type of material that will not conflict with your oil paints will suffice. Note that this must be a varnish that will not dissolve with your painting mediums or solvents as well. Wood lacquer, which can be found in any hardware store is a fast and inexpensive way to seal your wooden palette. Note that lacquer contains extremely noxious fumes and should be used in an extremely well ventilated area. Apply lacquer to your wooden painter’s palette with a brush in an extremely light layer. Let it dry for a few hours and add an additional coat. In between coats you can sand out any bumps that may form or become apparent. Two or three coats will give you an ultra-smooth palette that can be used to mix oil paints in 24 hours or less. Your palette will look like a fresh ice skating rink; my is it shiny! Please note that although the lacquer has dried it has not changed it’s chemical state like dried paint or dried oil will. The lacquered surface can be re-wetted with lacquer thinner. Don’t use lacquer thinner to clean your wooden palette if it has been prepared with lacquer; rather use mineral spirits or your regular painting solvent of choice to clean your palette. Lacquer thinner will remove your lacquered finish. Yikes…all that hard work right down the drain! Treating your brand new wooden palette with oil is my preferred method for preparing it. While this method takes longer to get your artist’s palette ready I think it’s well worth the wait. To prepare the raw wood of the palette you’ll need some boiled linseed oil, the inexpensive kind you can find at any hardware store in the metal quart or gallon can. Lightly sand the palette’s surface to remove any bumps and to open up the wood grain; this will make it absorb the oils more efficiently. Dip a rag into the boiled linseed oil and wipe the oil completely over the top of the palette’s surface (the surface you’ll be using for oil paint mixing). Let the oil soak into the wood for 30-60 minutes. Then use a clean rag and wipe off all excess linseed oil from the palette. After letting the wood palette dry overnight you can repeat this process of lightly sanding (not too much now), reapplying boiled linseed oil, and wiping off the excess oil. Three coats will take you three days to complete but the finish on the palette is amazing. You’ll have a beautiful looking palette that most importantly works really well. The dried linseed oil will prevent your oil paints from absorbing into the raw wood unlike when the palette was new and untreated. Although the varnish method of preparing a wooden palette takes far less time I find its surface to be a little bit hard for my taste. I like the soft feel that the palette treated with boiled linseed oil has to offer. Once dried the linseed oil is quite resistant to most solvents…even lacquer thinner. The secret to keeping any palette clean is not to let paint dry on it. Fortunately oil paints take quite some time to really harden up so even if left overnight you won’t have too hard of a time removing most of the paint. I scrape off as much paint as I can with the side of my palette knife. Next I use a baby wipe or two to remove any paint residue that has been left. It’s amazing how good baby wipes are at picking up oil paint! They have become my secret cleanup weapon! Finally I use a paper towel or clean rag to wipe off any residue that the baby wipes have left on the wooden palette. Once in a great while I will use some mineral spirits on the palette if I feel that there is some newly dried paint that is being stubborn. Aside from the cleaning instructions described above your newly treated wooden palette should be good for many years. The palette will slowly attain a painted patina but this in my opinion makes the palette work even better. You’ll begin to see a hazy version of where you put each color of paint. It actually helps you stay consistent with your palette’s setup. It also looks really cool, like you’re an old master painting wizard! Avoid scraping down your wooden palette with anything sharp. I cannot stress this enough. The side of your palette knife is as sharp as you should allow. 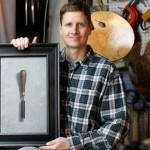 You’ll hear so many artists talking about how they use a razor or a window scraper to remove paint from their palettes. This method of cleaning a palette works well on a glass palette but is disastrous on a hand held wooden palette. Don’t be tempted. You’ll slice through your palette’s finish, nick the wood and create annoying slices and chips in your palette. Now you have a palette that used to be smooth and now it isn’t. A while back I put together a video depicting the steps involved when treating a wooden palette with boiled linseed oil. I agree with your suggestions about preparing wooden palettes, and have been doing that for years. I have a problem with wooden palettes, though. After about an hour of painting, I clean the palette by wiping away the mixed paint with a paper towel, then clean it further with some Turpenoid. When I start using the cleaned area again, there is always a little residual paint left in the wood grain, that muddies the new colors. I have to clean and re-clean it again, which takes away from painting time. It really annoys me! Nina, thank you so much for commenting it makes the blog so much more fun! Yes, any texture like wood grain will tend to hold onto paint. The hard varnish treatment cleans easier but I personally do not like the feeling it gives. Using just a paper towel and even some spirits is sometimes not enough to get all that residual paint. Lay your palette flat on a table where you can really buff off that paint. First scrape off your paint with a palette knife. Next use several baby wipes in a buffing motion with pressure on the palette… the paint really sticks to them. Then dry off the baby wipe residue from the palette by buffing the palette with paper towels. I’ll repeat this process until the paper towels have no color on them. Honestly this whole process takes me about 3 minutes to clean off my entire 14 inch wooden palette. I don’t try to save too much paint…if there is any question that paints are stiffening up, contain some crumbs, or are contaminating colors I just clean off the entire palette and start over. That in my eyes is better than ruining a painting! Baby wipes! That’s one thing I’ve never tried. Will do. Have you put your wooden pallet into the freezer with paint on it? Freezer no, but I have put it in the refrigerator on rare occasions. Hey thanks for this. I’ve just bought a wooden artists palette ($4!!) and I got it home and thought to myself, knowing timber I bet this needs prep (I’m an ‘old’ chippy/young artist). I was tipping linseed oil would be in the process somewhere and was glad to see that’s your preferred treatment. Also pointing out the practically of using one too, I’ve been fiddling away with a small elcheapo plastic multi dish number – enough! Looking forward to watching my new traditional artists palette board emerge over the next three days. Yes, good luck with your new palette Nick! Hi everyone – I read this article with some interest….I would like to make a palette for my niece, who paints with oils. I have absorbed all the details about oiling versus varnishing and this makes sense to me as I’ve worked as a carpenter for most of my life. However, I have no oil painting experience and wonder if there’s any consensus on which species of wood to use – I have heard beech mentioned but could easily use something else too, providing I can find a big enough chunk. Are lighter woods better, perhaps closer to the color of the canvas? And how about the grain on the wood… is a tighter-grained less porous species preferable for cleaning? Any thoughts would be welcome. Thanks! Jon, I’m sure you are way more knowledgable about wood types but I can tell you the lighter (weight) the better and a tight grain would be optimal. Any texture caused by the woodgrain would grab onto the paint and make the palette hard to clean and not as easy to use – I would think…I’ve never tried one with excessive grain/texture, but I also finish off my palettes repeatedly with BLO (boiled linseed oil). If you are custom cutting the palette balance is also an important factor. Some high-end palettes even counter weight the inside of the palette with thicker wood or other means. I don’t think wood color is a big determining factor because as soon as you get a few dozen hours using the palette, it will start to gray from all the paints. You can never quite get a palette back to pure wood-color if originally treated with BLO and to be honest that’s part of the charm! Some artists like to paint their palettes intensionally right from the start. 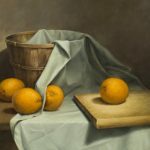 They’ll mix up a gray oil paint with an oil or alkyd medium and nearly polish the surface with the gray mixture…and then let it harden up. Some painters will (little by little over time) smear all their remaining colors together on the palette to create a neutral gray and let it dry in several subsequent layers after each painting session. Either way I’d love to hear/see what you end up creating – keep us posted! Thanks so much for that John. I’ll go down to the lumber yard and see what will fit the bill…sounds like a lightweight, stable, close-grained species will be best. I think I’ll leave the wood natural and finish it with the linseed oil as you suggest – that way it will look nice when I give it to her and then it can get it’s own patina with age. Good idea about counterbalancing the palette too – I would never have thought of that. Fingers crossed, and thanks again! Awesome, I can’t wait to hear more about it. Post a link to an image when it’s done and let us know what wood you used. All the cheap-o store bought palettes are plywood types, I’m not even sure what wood(s) they are. What do you mean by boiled linseed oil? Do you actually put it in a pot and boil it on the stove? If so, how do you clean the pot? Boiled linseed oil is the inexpensive kind you can find at any hardware store in the metal quart can. I would suggest getting your boiled linseed oil from an art supply store. I do believe there are differences to the hardware store variety. For treating a wooden palette? That’s unnecessarily expensive comparatively Bett. What you are generally paying for with artist grade oils is purity, refining, and sometimes alkalinity modification. 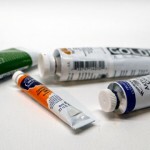 The regular oil linseed oil is not being used in your artwork so all should be fine ! John, interesting. I didn’t know the hardware store variety would do as good a job. Then I guess as long as you already have it, or need it for something else what you say makes sense. Not to be contentious – this just occurred to me though – an artist using oils would presumably already have artist grade linseed oil in the studio, in which case I’d think that with the relatively small amount we’re talking about to treat a palette, buying yet another tin of something you’re going to use only for this would actually cost more and be more wasteful. And I wouldn’t want folks to unwittingly use the hardware stuff for a painting medium instead of artist’s grade oil. Boiled linseed oil is just linseed/flaxseed oil with added heavy metals for quick drying. I use the same jug from the hardware store (same product, for $8 for a jug, and $20 for the little 8 oz jugs at the artists supply store, that’s a big difference for the same product) for both my oil painting and my non-food item woodworking! 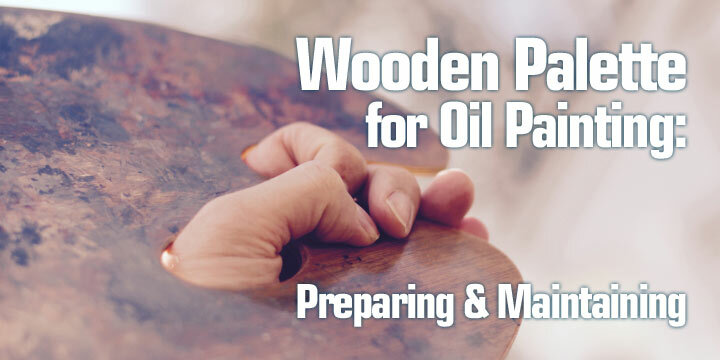 I ended up on this site in preparation to make my own wooden palette for my own oil painting. A lot of oil painting wet supplies can be found much cheaper at the hardware store, which I appreciated from my years of oil painting on found wood to pay the bills! Artist’s grade is further refined, most notably “alkali refined” and is designed to yellow less and last longer. For palettes use whatever (I’ll use the regular BLO) but for paintings, use alkali refined linseed oil or any of the other artist’s-grade oils available from reputable manufacturers. No but the process will take longer with raw linseed oil. Boiled linseed oil has driers in it to dry faster.